What’s in Our Fish — and Our Gators? New research looks at whether PFAS — perfluoroalkyl and polyfluoroalkyl substances — are accumulating in our wildlife. BY T.C. GUILLETTE, postdoctoral researcher at the Belcher Laboratory, and MADI POLERA, assistant project manager for Cape Fear River Watch. Both collaborate with NC State’s SCOTT BELCHER, whose research on PFAS exposure North Carolina Sea Grant has supported through a Community Collaborative Research Grant. Hear Scott Belcher discuss his research on PFAS exposure at the next Science Café, when he presents “What Have You Been Drinking?” on Thursday, March 21, at 7:00 p.m. at the Daily Planet Café in downtown Raleigh. As avid anglers, we were curious about the impact that years of PFAS in the Cape Fear River could have on local wildlife. As scientists and liaisons among stakeholders in the river basin, we also wondered if these chemicals were an unidentified piece of the puzzle in the fishery restoration campaign that now has been underway for over a decade. With a Community Collaborative Research Grant, our team was able to focus on questions that helped address whether humans are exposed to PFAS when eating fish and also to examine the health-related effects of these man-made chemicals on the local wildlife. This “One Health” philosophical approach directly connects the health of people to the health of animals and the environment. Before we could study the impact of PFAS on the local aquatic wildlife, our team first needed to determine the extent of exposure to PFAS within this aquatic ecosystem. Chronic exposure to two types of PFAS found within the Cape Fear River’s watershed, perfluorooctane sulfonate and perfluorooctanoic acid, have known adverse health effects in mice and are associated with negative health effects in humans. (See the studies below). Adding to the unknown, exposure levels of novel PFAS, including GenX, are relatively unexplored in wildlife populations along the Cape Fear River. For the first part of our study, we focused on striped bass — a once plentiful, economically important species that has been under a harvest moratorium since 2009, due to the species’ lack of natural reproduction in the Cape Fear River. We partnered with the N.C. Wildlife Resources Commission during their yearly capture surveys to obtain blood samples from striped bass along the Cape Fear River. At a site with low PFAS contamination — the Pamlico aquaculture facility — we also caught and sampled striped bass. Striped bass along the river have higher blood concentrations of perfluorooctane sulfonate, a type of PFAS associated with liver and immune dysfunction. The second part of our study examined PFAS in the local American alligator population of coastal North Carolina. 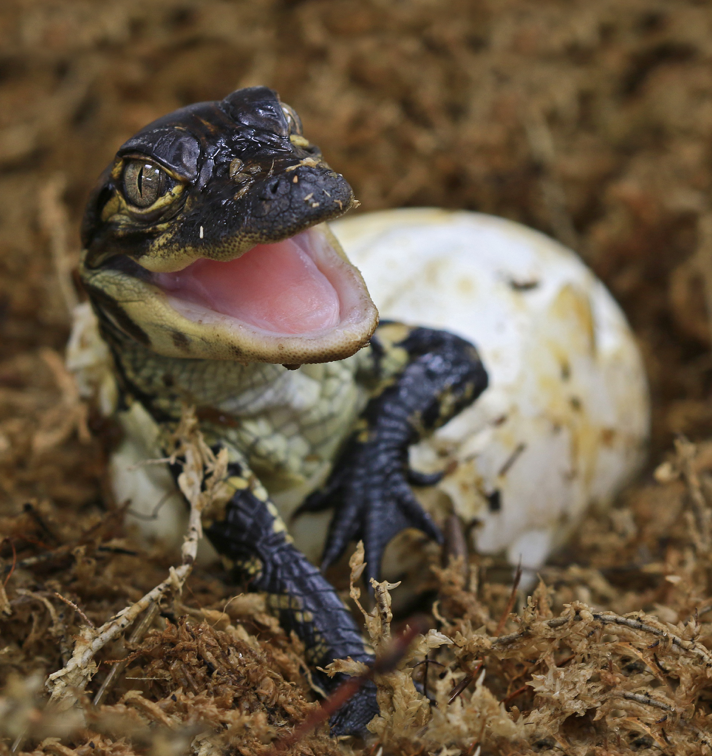 As top predators that usually stay within five miles of their territory, alligators serve as a great “sentinel species” for human health — animals that can provide advance warning of environmental hazards. Our team sampled alligators at Lake Waccamaw and Greenfield Lake. 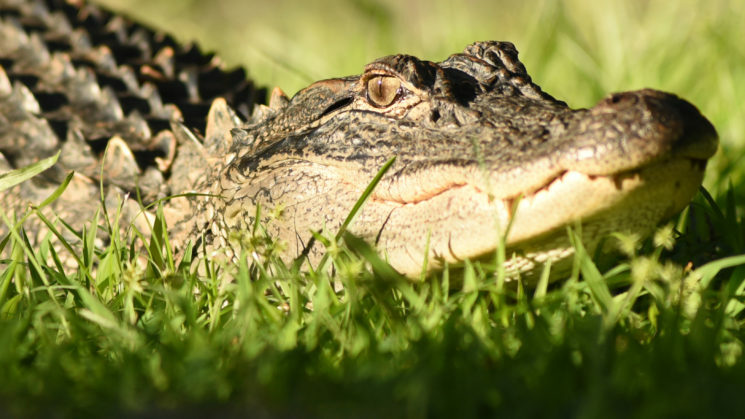 We hoped that Lake Waccamaw would serve as a reference site; residents had informed the team of a healthy population of alligators at the location. Alligators in Greenfield Lake, close to Cape Fear River, have 10 times higher concentrations of PFAS in their blood. Our wildlife is exposed to a soup of chemicals. PFAS are accumulating in their bodies, and higher levels of perfluorooctane sulfonate, in particular, are associated with higher levels of blood biomarkers that indicate altered liver and immune function. This implies humans, in turn, face PFAS exposure when they consume this wildlife. Our work suggested more areas to study, including questions about the impact of PFAS on wildlife. Madi Polera, a new graduate student involved in the work, will extend these studies by examining the effect that novel PFAS have on striped bass egg quality. Work during our Community Collaborative Research Grant also has stimulated a vital component of environmental studies: civic engagement. We encourage Cape Fear River communities and others to interact with our team so that we can prioritize our exploration into PFAS to best serve the science and the broader public. Our full results will soon be published, and we hope that they will help stimulate more questions into PFAS accumulation and the effects on wildlife and people. EPA. 2016d. “Health Effects Support Document for Perfluorooctane Sulfonate (PFOS).” EPA 822- R-16-002. EPA. 2016e. “Health Effects Support Document for Perfluorooctanoic Acid (PFOA).” EPA 822-R16-003.